The priorities for Sol 2115 are to image the rover's wheels and acquire the images needed to plan a drive back to the Sol 1999 location, where we might start another drilling campaign. The MAHLI images of the wheels taken on Sol 2114 with the dust cover closed show that there is enough dust on the cover to make it difficult to see the wheels, so a different approach to wheel imaging was planned for Sol 2115. To minimize the risk of dust contamination of MAHLI's optics while the cover is open, MAHLI will image only the wheels on the left side of the rover from above the wheels, keeping MAHLI pointing downward while the dust cover is open. 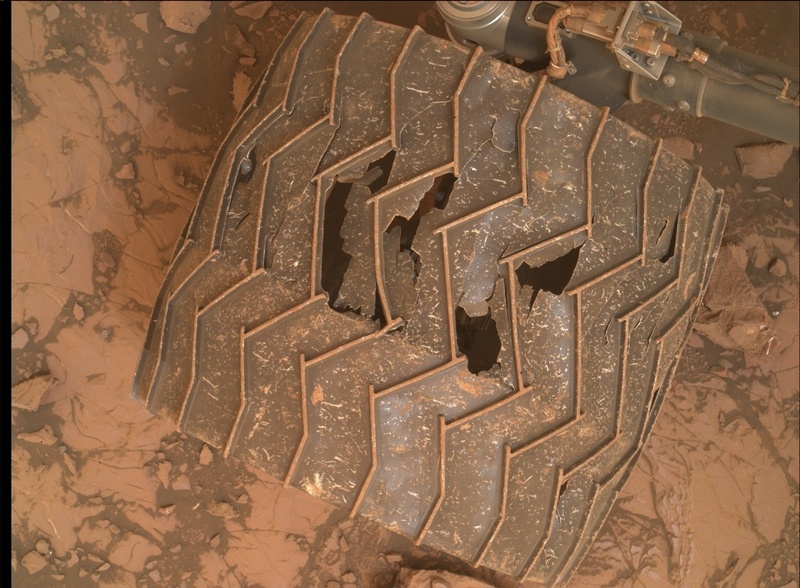 The wheels on the right side of the rover will be imaged by the left Mastcam rather than MAHLI. Then the rover will turn in place to allow imaging in the direction of the next drive, toward the southwest. After acquiring the standard post-drive data, Mastcam will observe the Sun and crater rim to continue the monitoring of the dust opacity over Gale Crater. These observations will be repeated twice early in the morning on Sol 2116 to look for short-term changes in opacity. In addition, ChemCam will use the AEGIS software to autonomously select a bedrock target for a 3x3 LIBS raster. Tactical planning went smoothly, so it was an easy day for me as SOWG Chair!